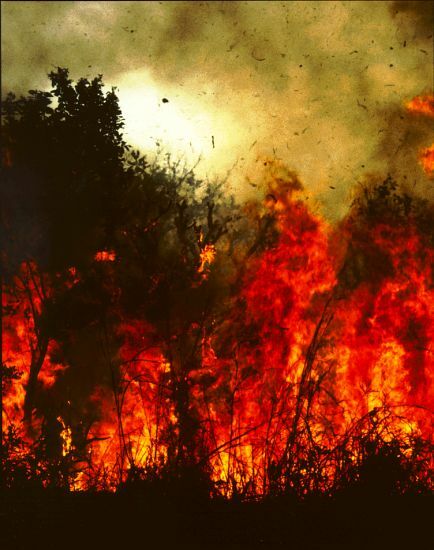 This is a savannah grass fire in Ivory Coast, Africa. I took the picture during a field campaign in early 1991 somewhere between Abidjan and Bouake, in a place called Lamto reserve. I got as close as about 5 m to the fire and then had to step back, because my skin was starting to get so hot that it hurt. These fires are extremely intense, but just as quickly gone as they start. I could literally walk behind the fire and touch the ground only a few seconds after the fire passed. The ground was barely warmed up, which is the reason why the wildlife and flora of the soil survives these fires. Some rain permitted, new grass will grow only a few weeks later.